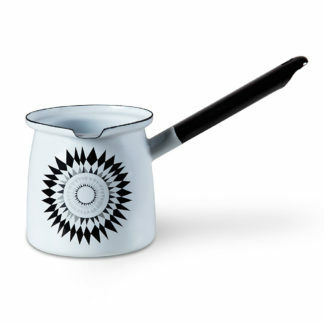 Ceramic enamel, 18cm, capacity 3.5l. Presented in a beautiful gift box. 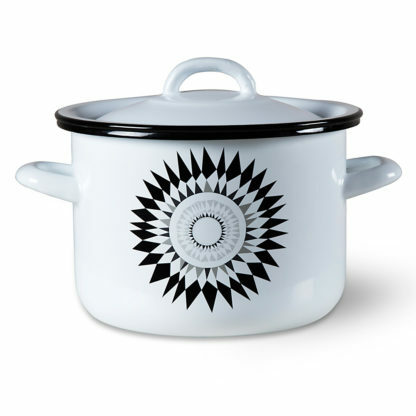 From the land of the midnight sun comes the enamel range. 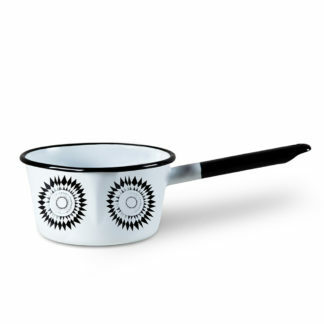 Enjoy your cooking with the rays of the midnight sun in this enamel cooking pot. 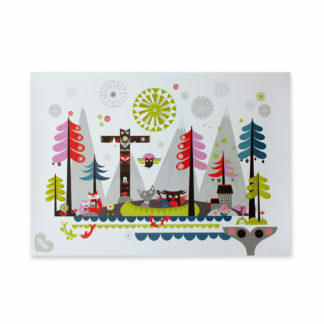 The “Midnattssol” range is a celebration of our Scandinavian heritage. Summer and winter, black and white, darkness and light. A beautiful happy place! Our ceramic enamel is dishwasher and oven safe up to 180°C. It is safe for use on gas, electric and induction hobs. Enamelware is glass fused onto heavy-gauge steel. This makes it smooth, durable and chemical resistant as well as great at holding brilliant, long-lasting colours. These products are hand-enameled and small imperfections can be expected.